When Dance of the Dead comes into play, if it's in play, it becomes an Aura with enchant creature. 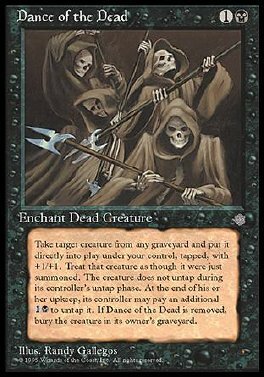 Put target creature card from a graveyard into play tapped under your control and attach Dance of the Dead to it. Enchanted creature gets +1/+1 and doesn't untap during its controller's untap step. At the beginning of the upkeep of enchanted creature's controller, that player may pay 1B. If he or she does, untap that creature. When Dance of the Dead leaves play, destroy enchanted creature. It can't be regenerated.